To locate a specific string, type the string you want to search for and click the Find icon, as shown in the following image. Note: The Find functionality will locate the page that the current string is on and underline it. In order to find the string within the page, you must use the Find option in your browser. Notice that the WebFOCUS Viewer displays the Match Case button with a red line across it to indicate that it is active. The WebFOCUS Viewer searches the report and underlines the first occurrence of the string. Note: If multiple occurrences of the string display on the same page, the Find functionality will underline the next occurrence. When no more occurrences of the string are found, the next page that the string occurs on is displayed with the first occurrence of the string underlined. You want to use the Viewer Control Panel to navigate a long report called Inventory Sales within State to find occurrences of the string Digital, a type of electronics that you sell. After you run the report, WebFOCUS displays the first page of the report in the Viewer. To search for Digital electronics, type Digital in the input box and click the Find icon, as shown in the following image. The WebFOCUS Viewer returns your report with the first occurrence of your search string underlined, as shown in the following image. Click Find again to locate the next occurrence of Digital. Path. Accessible from the properties dialog box of any library report. Library URL. a standard URL that identifies the report library (http://host:port/ibi_apps/lib-report.rc). Note: The ? is a required component of a qualifying URL. 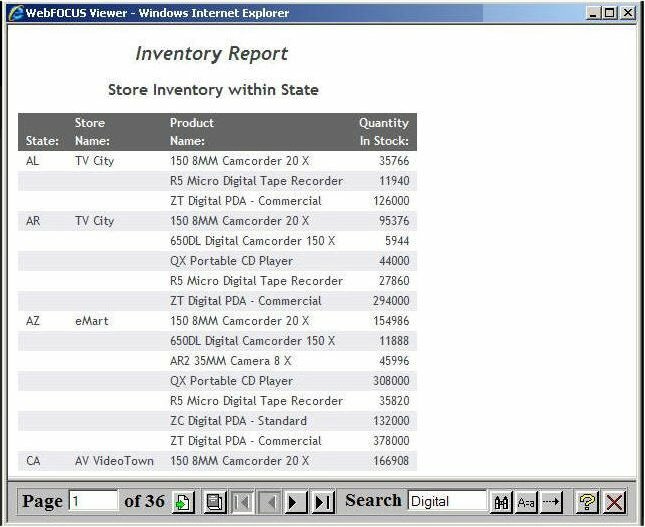 The resulting URL can be used to open the current version of this identified library report in Excel and other types of documents, such as Microsoft Word or an HTML page.